Windows App Store. It's not iTunes, honest. New screengrabs of the Windows 8 app store have been published online, showing an app market that's not unlike another famous app store we could mention. It's no secret that Windows 8 will incorporate apps, given the huge amount of attention the little nuggets of software have received since the dawn of the iPhone. But it looks like that's not the only influence that Apple has had over Microsoft, with the colour scheme and design looking mighty like those of iTunes. The screenshots are said to be running in Windows 7, which hints at backwards compatibility for the software. Interestingly, the grabs seem to confirm the Windows App Store name; Microsoft was pretty keen to stop Apple trademarking the term 'app store' earlier this year – it's all becoming clear. 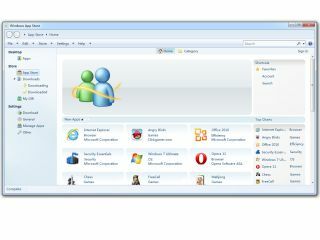 Apps in the screengrabs – which are by no means necessarily genuine – include Internet Explorer, Windows Live Messenger, Office 2010 and, of course, Angry Birds.